Chaga mushrooms are a fungus which is also known as Inonotus obliquus. For centuries Chaga mushrooms have been used as a tea ingredient in the east. It has well-established health benefits. Here are some of the health benefits of the Chaga mushroom. Inflammation is a complex biological response of body tissues to harmful stimuli, like pathogens, damaged cells, or irritants, and it’s also a very protective response that involves immune cells, blood vessels, and also molecular mediators. It can be both good and bad. The terrible effect is that it can cause many dangerous diseases and conditions. Such as Allergies, diabetes, Parkinson’s and sometimes even cancers. And as we all know many of these diseases is very deadly especially cancer which to this day doesn’t have an effective cure. One of the best things about Chaga mushrooms is that it helps reduce inflammation, so your body stays safe from many deadly diseases and other medical conditions. You can drink Chaga with tea, which is very healthy and it can put your digestive system in a great condition. It’ll help your liver against indigestion. The Chaga mushrooms also contain botulin which has a liver detoxifying effect. This helps you clean out the system and start fresh. It also protects your liver against damage and other liver related problems. It protects your liver in many ways. Also because you can use the Chaga mushroom in your tea it can help you digest foods better. And you’ll be relieved of stomach aches, gas and other liver related problems which cause a lot of health problems in your daily life. The Chaga mushroom is full of healthy properties and vitamins which help your immune system. Your body is protected by the immune system which insulates you against many diseases, stresses and sometimes even feeling tired, etc. It keeps your body strong which as a result keeps your mind strong as well because often one depends on the other. Chaga is an adaptogen which is simultaneously working in two different directions to help boost and modulate the immune system. Which means it will boost your energy, and mood. You won’t feel stressed because it boosts your energy. And you won’t feel tired too often which can happen to people with a weak immune system. Every year millions of people die of cancer. It’s one of the most deadly diseases known to mankind. There is still no proper cure for this disease. But Chaga extract is known to be approved as a treatment for many types of cancers in Russia since the 1950’s. The betulinic acid that is found in Chaga mushrooms is known to induce apoptosis or cell death and they prevent tumors from developing and growing. A large number of research articles have confirmed that Chaga mushrooms have exciting anti-tumor ingredients. The Chaga mushroom is a great medicine against cancer. It can help you fight one of the most dangerous diseases on earth with the added benefit of being delicious. 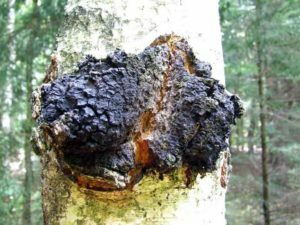 Chaga mushrooms are full of benefits. The mushroom helps you support the integrity of blood vessels and often provides soothing properties especially in times of irritation. This helps people who are suffering from pain. It also fights neuropathy which is very helpful. And not only that but it also helps you fight diabetes which is a very common condition nowadays. There aren’t many things that are very effective against diabetes which is why Chaga mushroom can’t be beaten. Neuropathy is another condition that isn’t easily cured and can only get worse if it is not properly treated. The Chaga mushroom can do that for you without costing a lot of money. We all love our skin. And no one loves to age. But it is impossible to stop aging or keeping your skin the same way forever. But with the help of Chaga mushrooms, you can at least delay that process. Chaga has very high melanin content. As a matter of fact, it gets its recognizable famous dark color because of it. Melanin is a powerful antioxidant, and it protects your genes and DNA. Melanin is also known to be the main pigment that is ever present in our skin, and many experts think that Chaga’s melanin content can, in fact, increase the health of your skin, keeping the skin beautiful and supple at the same time. It can also help you protect both the skin and hair from sun damage and may also help in diminishing the size of age spots. Both ulcers and gastritis cause many problems in your body. It can cause burning stomach pain and also the feeling of fullness, bloating or belching. It also often causes heartburn. And sometimes nausea or vomiting. It can even cause loss of appetite which can be very dangerous because appetite loss can lead to many diseases because of weak immune system. Ulcers are many times caused by bacteria like the Helicobacter pylori. So a healthy immune system has the ability to fight this pathogen off and keep your body safe from harm. Ulcers can be soothed by its use of Chaga mushrooms, but it may depend on what the patients condition is. Everyone knows the result of low or high blood pressure. It leads to serious health consequences and even death. The same with high cholesterol levels. It can cause heart failure, heart attack, chest pain, anxiety, stress and many other things. Which is why they need to be balanced carefully. Any sign of imbalance can lead to stroke or heart failure. The Chaga mushroom helps you do that. It helps you keep your blood pressure and cholesterols in check because the betulinic acid in Chaga is known to help break down the bad LDL cholesterol inside your body which helps keep your body safe from harm. The Chaga mushroom protects your DNA from harm. It keeps the immune system strong which keeps you from being sick. The Chaga mushroom contains melanin which protects the cells and DNA in your body. As a result, it helps your skin and many other properties in your body. It also protects you against many DNA-related diseases. Chaga is an easy treatment for many complicated DNA problems which would cost a lot of money to get traditional medical treatment for. The Chaga mushroom protects your DNA for a very low cost. Which is why the Chaga mushroom is often used as a medicine in the East.